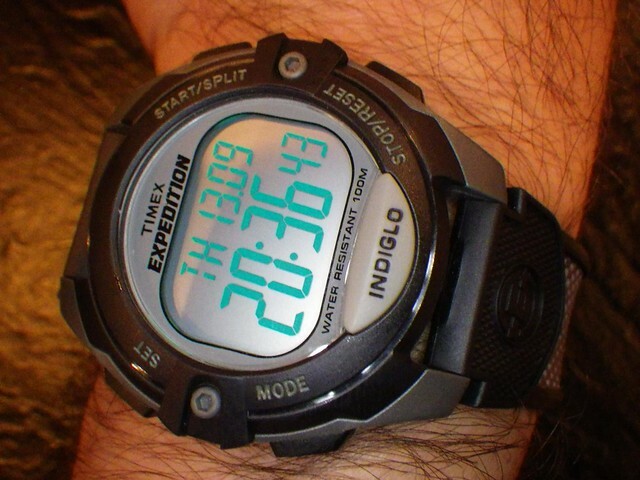 While travelling in the USA I came across the Timex Expedition T40941 digital wristwatch on display at Macy’s department store, checked the manual and bought it immediately because it was just what I wanted for only $48. The problem with comparing digital wrist watches online is that the manufacturers offer so many different models, which are poorly differentiated and have terrible alphanumeric product codes as names. So it was lucky that I found a watch that suited my requirements on display where I could try it out there and then. Size: large enough screen to show the time, day of the week, date and month clearly without having a big chunky watch dial like CASIO G Shock’s. Time Zones – Two Time Zone Settings. I set T1 to my current timezone and T2 to home. During normal watch mode all I have to do is press Start/Split and it will display the T2 time, day of the week, month and date. Colour: Black and Silver – I don’t want a watch that has flashy colours like orange, green or yellow. Toughness: The Timex Expedition T40941 is rated water resistant to 100 metres but doesn’t mention whether it works below zero. The crystal watch face is slightly recessed which should mean it has a lower chance of being scratched. Illumination: the INDIGLO button is located at the bottom of the watch face where it is easy to find in the dark. Once pressed blue electroluminescence lights up the letters and numbers on screen rather than the background of the watch face. Pressing the INDIGLO button for 4 seconds activates Night-Mode for 8 hours, where any button press illuminates the numbers/letters on screen. Timer and Stopwatch: Timer can countdown from 100-Hours or less which is handy so you know how much time you have until an important event eg checking in at the airport. The Stopwatch/Chronometer says it can work for 100 hours with Lap and Split Times but I’m unlikely to make use of it. Alarms: Three Daily, Weekday, Weekend or Weekly Alarms with 5 minute repeat. Strap: Two tone silver patterned plastic. Let’s face it this is a sub $50 watch so you’re not going to get an expensive leather band. Anyway plastic is easier to clean if you wear the T40941 while doing outdoor activities or adventure sports. There’s a small round analog compass on the strap which you may find useful or you can cut it off. Next PostNext Does Technology Isolate or Connect Travellers ?